The full extent of the problems with the aft bulkhead become painfully apparent. On removing the galley and chart table, we find that the bulkhead is rotten across half its width, much more than was mentioned in the survey. Also, the cockpit floor is thoroughly rotten against the bulkhead and further aft. 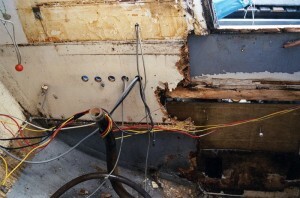 Underneath the bulkhead and engine compartment we find a completely enclosed area, full of water and rotten wood pulp. The drain hole has been blocked for years and the water has been washing from side to side and rotting all the woodwork. This includes the engine supports, even though they were encased on three sides by fibreglass as the fourth side, against the bulkhead, allowed water to creep in and rot them. Half of the bulkhead will need to be replaced, as well as the cockpit floor and forward cockpit floor supports. Oh dear. Winter depression sets in.